Jurgen Stock, Secretary General of Interpol, left, and commander-in-chief of Dubai Police Abdullah Al Marri take part at a press conference during the opening day of 87th International Criminal Police Organization (Interpol) General Assembly in Dubai, United Arab Emirates, Sunday, Nov. 18, 2018. 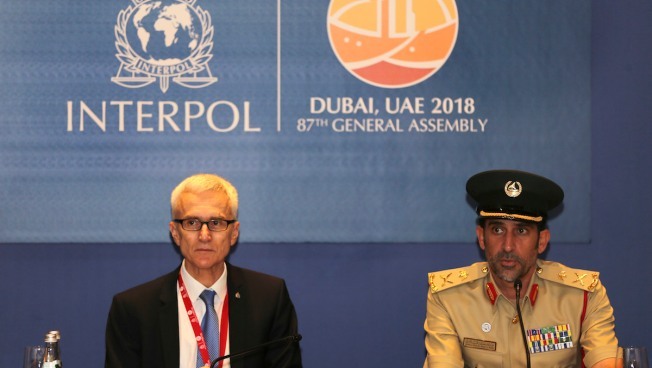 Police chiefs from around the world gathered in Dubai on Sunday for Interpol's general assembly to select a new president after the agency's former leader was detained in China. Meng Hongwei— who was China's vice minister of public security while also leading Interpol — went missing while on a trip to China in September. It later emerged that the long-time Communist Party insider with decades of experience in China's security apparatus was detained as part of a sweeping purge against allegedly corrupt or disloyal officials under President Xi Jinping's authoritarian administration. Interpol member-states will also be deciding whether to accept Kosovo as a full member, which would allow officials there to file red notices for Serbian officials that Kosovo considers war criminals. The red notices are alerts circulated by Interpol to all member countries that identify a person wanted for arrest by another country. Interpol says there are 57,289 active red notices around the world. Interpol acts as a clearinghouse for national police services that want to hunt down suspects outside their borders. The body, however, has faced criticism that governments have abused the "red notice" system to go after political enemies and dissidents, even though its charter explicitly proclaims its neutrality and prohibits the use of police notices for political reasons. Two years ago, Interpol introduced new measures aimed at strengthening the legal framework around the red notice system. As part of the changes, an international team of lawyers and experts first check a notice's compliance with Interpol rules and regulations before it goes out. Interpol also introduced an appeals body for those targeted with red notices. Chinese authorities say Meng is being lawfully investigated for taking bribes and other crimes. China's beleaguered rights activists point out that as someone with a seat atop the country's powerful public security apparatus, Meng helped build the opaque system of largely unchecked power wielded by the ruling Communist Party to which he's now fallen victim. Meng's wife has told The Associated Press from France that the bribery accusation he faces is just an excuse for a lengthy detention and that he is being persecuted for political reasons. As more than 1,000 delegates from 192 member-states began filling the main hall for the annual event, Interpol Secretary-General Jurgen Stock explained to reporters that the agency's rules did not allow for Meng to continue acting as president. Meng had been serving as president since November 2016, and his term was due to end in 2020. He said Interpol received Meng's resignation letter from China on Oct. 7 and that Interpol was notified by Chinese authorities that Meng is no longer a delegate to Interpol. 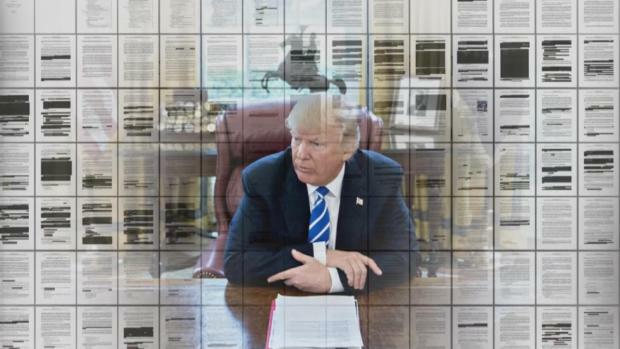 "It sounds a little technical but again that automatically leads to the fact, according to our rules, that he is not the president anymore," Stock said. "We had to take the measures to ensure the functioning of the organization." Meng's representatives say Interpol accepted an unsigned resignation letter without any resistance and without evidence of his consent. In Meng's place on Sunday, senior vice president of Interpol's executive committee, Kim Jong Yang of South Korea— who was previously named acting president — helped open the ceremony for the general assembly meeting. A little more than a week ago, Stock told reporters in France— where Interpol is headquartered— that there was no reason for him to suspect that anything about Meng's resignation "was forced or wrong." He said he "encouraged" Chinese authorities to provide information about Meng's location and legal status but can do no more because the role of Interpol is "not to govern over member states."